Kasymjomart Tokayev, chairman of the upper house of the parliament of Kazakhstan, said addressing the Kokchetav regional maslihat or legislature that the national Constitution would be amended in 2008. According to Tokayev, the amendments to be adopted by the parliament as a draft law would increase the number of deputies elected by party lists. As things stand, the majilis (lower house of the parliament) comprises 77 lawmakers and only 10 of them are elected by party lists. Most political parties in Kazakhstan insist on equal election by party lists and in single-mandate districts. Other amendments to the Constitution are expected to enhance the president's powers in the matter of control over the executive branch of the government. The institution of parliamentary majority will be established. All of that is being down to allow the ruling party (the one that came in the first) to form the government. Off the record, however, insiders imply that there is more to the amendments than meets the eye. Additional functions and powers of the parliament are expected to serve as a screen for the objective of extending the president's term of office. 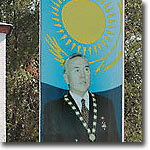 Nursultan Nazarbayev's term of office expires in 2012, and the Constitution as it is does not permit him to run for president again. Kazakh politicians are already putting out feelers to gauge public reaction to the idea of constitutional monarchy in Kazakhstan (ambassador to Austria and the president's son-in-law Rahat Aliyev was the first to suggest it) or lifetime presidency for Nazarbayev (suggested by Romin Madinov, lawmaker and deputy leader of Nur-Otan or Light of the Fatherland party). These ideas find the parliament quite sympathetic since the parliament itself is fully controlled by Nur-Otan, the party of the president himself. It is functionaries of this party who are expected to suggest an extension of the term of office or lifetime presidency when amendments to the Constitution are on the floor. Needless to say, the president (a democrat that he is) will back lawmakers' initiative. Seriknai Alibayev, ex-deputy and leader of the Astana organization of the National Social Democratic Party, is convinced that the rumors are not entirely groundless. "That's a distinct possibility," he said. "Recall what Aliyev was saying about monarchy and Madinov's statements... Everything will be done to extend Nazarbayev's term of office. It will be done by the parliament, of course, to create the illusion that it is an initiative of the people... The regime won't miss its chance."